As plots of ground and garden go, orchards hold a special place in my heart. For the gifts of promise, patience and firmly-established roots look no further. The planting of my own orchard has been an episodic tale of discovery and reward. In fact, this year my pear trees produced an admirable sampling of fruit that I was all too eager to pick and enjoy. 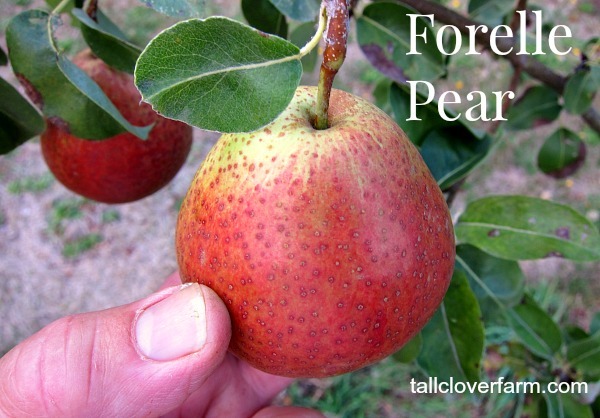 And now that I’ve shared my list of favorite apples with you, let me continue our walk through the orchard with my list of preferred pears (that is for now). 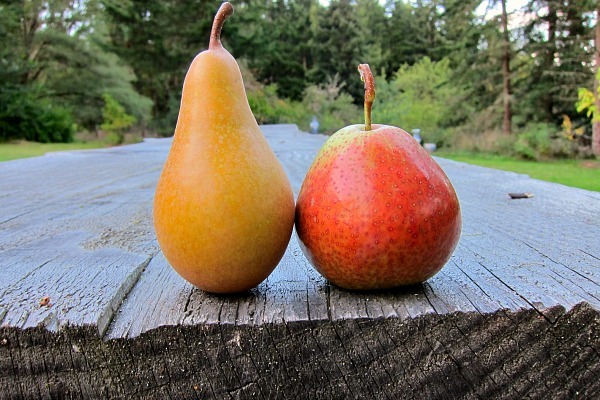 As a general rule, pears, unlike apples, ripen best when picked mature but not fully ripe. If you leave a pear on the tree too long, it ripens from the inside out, resulting in a mushy, unappetizing flesh and core. I pick pears when full size and firm, usually very firm. A stint in the refrigerator gives the pear’s sugars time to develop and form. Commercially grown pears have already been stored in refrigeration, so they ripen on the counter within a few days or even up to a week. The wait is worth it. There are summer pears such as Bartlett, Orcas and Clara Frijs which ripen quickly and are picked in September; and there are winter pears, which require maturation through refrigeration and are picked beginning in mid-October. 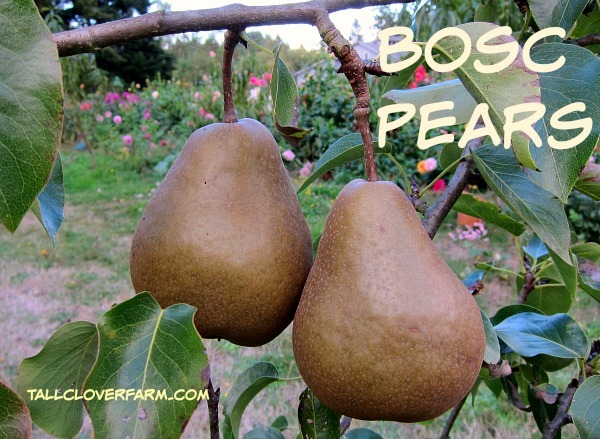 The Bosc pear is a russeted gem that produces a crisp, perfumed and firm pear perfect for eating out of hand, baking up in pastry or poaching in sweet wine. Because the skin is thick and brown, and the flesh hard before maturity, the Bosc pear has few pests or problems from fruit set to harvest. It is a winter pear, meaning you pick it in October, refrigerate it, and later ripen it at room temperature. 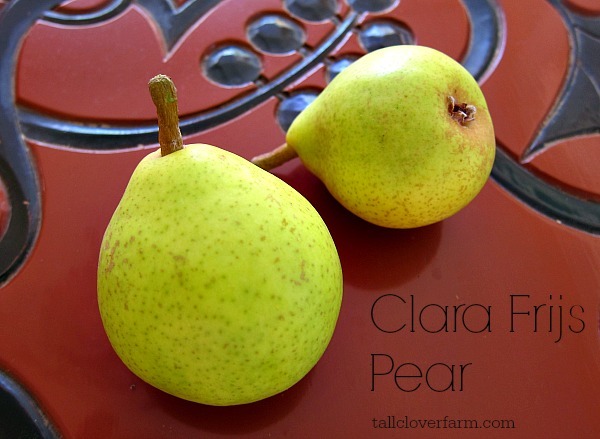 My latest sweetie-pie of the plate and orchard is a pear from Denmark: Comtesse Clara Frijs. A tip of the hat to the Danes, for this is a succulent, crisp summer pear that drips with a honey-flavored juice that is light and inviting, and leaving you wanting more. (Oh Tom, you do go on.) Seriously, this is a pear that captures the giving crunch of a Asian pear with the rich flavors of a European pear. And not to poo-poo our local favorite, but the Clara Frijs pear outshines and out-delivers the Bartlett pear in the areas of texture, taste and storability. Pick this summer pear in mid-September, and it will ripen off the tree in about a week, but stores longer if refrigerated. A cross between the Conference pear and the Comice pear, the Concorde pear can’t hide its rich parentage. Flavorful, juicy, and slightly firm when ripe, the Concorde pear stands out a superior pear in my orchard. A truly great fresh-eating pear. 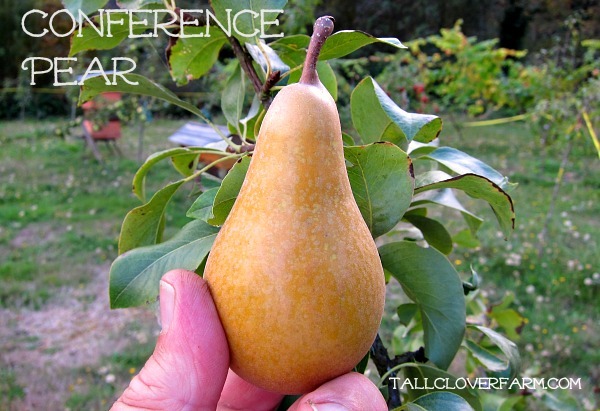 I can see why the Conference pear is the most popular pear in Great Britain and western Europe. Conference pear is a great fresh-eating pear and also reputed to be a fine baking pear, though I cannot speak to that as I ate all of mine out of hand within weeks. This beautiful pear makes a stunning and delicious still life with a plate of cheese and bread. Beautifully speckled and vividly colored, the pear Forelle (meaning trout in German) is most aptly named. This diminutive little guy is quite the looker and wonderfully firm and juicy at the same time. To me, it has a floral flavor mixed with a light butterscotch aftertaste. As with most winter pears, Forelle is a great keeper. Discovered just north of here on beautiful Orcas Island, the Orcas pear is a disease-resistant summer pear variety that ripens in September. Like a Bartlett, this pear ripens quickly once picked and you must deal with a lot of pears that don’t store that well. Canning is one answer, sharing another. The pear’s flesh is creamy and melts in your mouth, while the juice holds a brightness and sweetness, usually found in winter pears like Comice. Hi Jacqui, I have a little rust problem on pear trees but so far so good, as I too go the organic route. Pear slugs don’t seem to be too much of a problem lately. As for Damson plum, oddly I don’t have any planted. I love Green Gage for pure unbridled plum flavor and sweetness, and I also like Italian plums for baking, canning and drying. Beautiful photos and I love the gorgeous fonts! I never knew Forelle pears existed until the grocery store where I am a cashier got some in this week. Bought and ate one tonight – cute little fella with good flavor, even though it was still a little too youthful and crisp to display its true mature flavor – I should have waited a few days. I liked the sweet juiciness of it. There were five viable seeds inside – I’m going to plant them and see how long it takes to begin to see fruit when they’re pruned to “shrub” size and shape. Any thoughts? I live in upstate NY, in the northern Finger Lakes region, four miles east of Cayuga Lake in the heart of wine and orchard country. How well do pears typically grow in close proximity to black walnuts? The 2/3 acre we’re on is covered with young and old black walnuts, as well as honeylocust trees (both a plague, if you ask me), but we merely rent so we can’t just wholesale cut them down so I can grow fruits! I’ve planted many different fruits – honeyberries (Lonicera caerulea), red raspberries (blacks grow wild here in great profusion), blackberries, strawberries, red currants, peaches and apples (both from seed), serviceberries, a mulberry, silverberry (Elaeagnus commutata), and two hazelnuts. I’m going to plant a bunch of peach and Stanley prune plum pits this week to sprout next spring – I have great luck doing that, with several new seedling peaches, a bunch of seedling oaks and other baby trees from seeds sown last fall. I’m looking for Suncrest peach pits, which I grew in Colorado and had fruit on them within five years – we sold the house the first year they bloomed and I never got to taste any of them. 🙁 Suncrest are enormous peaches with the greatest flavor, sweetness, texture and juiciness I’ve ever experienced in a peach. I love them! The only nursery I found that carries them is in California, they ship in January, and the one I bought last winter froze to death, while the seedling I planted next to it is still thriving. … I’m determined to grow as many fruits and other things as I can, trying to make this a better place than we found it, and to provide food for us and others. Hi Becky, wow, you sound like you’ve got a lot going on and growing in your garden. In regard to planting a pear or an apple seed, you can pretty much plan on a whole different tree from the parent. While peaches and plums pits usually grow true to the parent tree, apple and pear seeds do not. You may get a whole new chance seedling, a surprise of sorts. Good luck with your orchard endeavors and report back on your progress when time allows. Thanks for sharing your story with us. Thank you, Tom, for YOUR kind words! I’ve always been a gardener, with my mother and on my own, wherever I’ve lived. I’ve fought climates and learned to live with them (5,300 feet elev. in Canon City, CO; nearly 9,000 feet high in Colorado’s Wet Mountains; sea level in Virginia Beach; 700 feet in upstate NY, etc. ), always trying to push the limits. Oh – I forgot to mention that I also have 2 Manchurian bush apricots, a few blueberries, a cranberrybush viburnum…. and a growing infestation of garden huckleberry (Solanum nigrum – thankfully, an annual plant, but prolific as all get-out, and the fruit smells and tastes wonderful). I found an online article about pruning for SMALL fruit trees, rather than planting short-lived dwarf or semi-dwarf trees, so now I’m going to see just how many trees I can cram onto this lot and how small I can keep them! I’m in Zone 5B, so it’s a lot more congenial than the Zone 3 I had on the mountain. 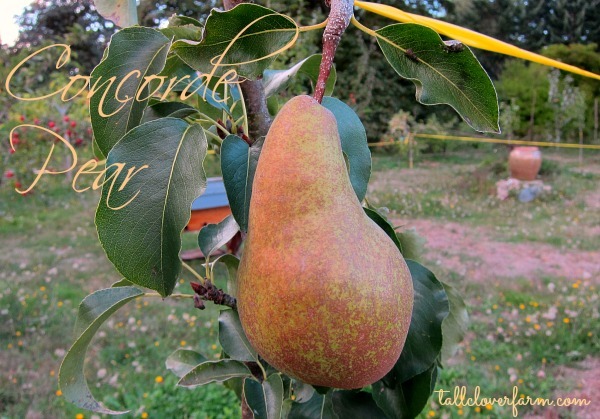 Where did you acquire your Concorde Pear Tree? I’ve been looking everywhere and all I keep finding is that they are either sold out or available sold in the UK. As I live in Northern Utah, that doesn’t help me much. I adored the links you posted but couldn’t find it on their pages either. As a person who both loves to cook and is into canning I want a sweet pear that holds its own. So far the best pear I’ve read about is the new Concorde. Please help me out if you can. Hi Telisha, I’m sorry to say those nurseries no longer carry that pear, which surprises me as it’s awesome. 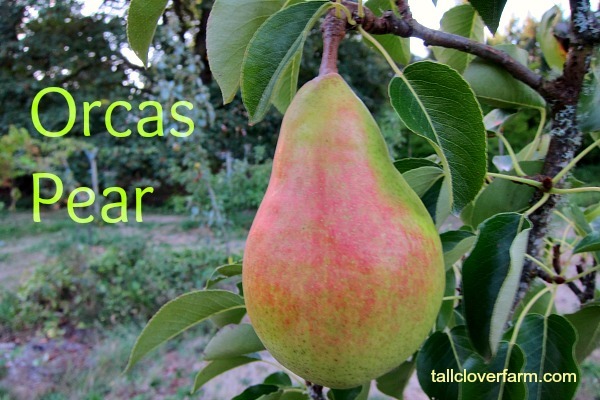 But, yes there’s a but, I did a little research about another pear that is delicious and well-suited to canning, available at Fedco Nursery in Maine, and it’s named after my home: Washington State. You may wish to contact the nurseries I listed and ask if they will get the concorde pear next year and if not would they know of a source for the home orchardist. Good luck! I’ll keep my eyes open, too, in case I run across a mail-order for the concorde pear.